On November 20 at the Yumuchi utaki, Taketomi, the Umanusha, which represents the motion of riding a horse. On November 20, the Tanadui Festival, which dates back over 600 years and has been designated as an important intangible cultural heritage by the Japanese government, was held at the Yumuchi utaki (or sacred place) on Taketomi Island. Many tourists from outside the island crowded into the Yumuchi utaki and enjoyed performances of traditional dance and comic drama. The locals dedicated the dance for a good harvest to the gods on November 21. Taketomi residents hold the Tanadui Festival in the hope that planted seeds will grow successfully and for a year of good harvests. 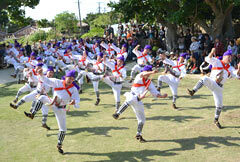 This festival held over ten days is the biggest event held on Taketomi Island. On November 20, the festival opened with a performance in the garden in front of the utaki, a bold display of stick fighting, and Umanusha, which represents the motion of riding a horse. The traditional short comedy drama Kajiko (metal-smith) and the Yuhiki were performed on stage. Previous Article:Blue frog found in the northern mountains a sign of a happy future?